A team of eight undergraduate students in the University of Notre Dame’s School of Architecture will formally present design proposals Friday (April 22) for a unique new housing project on South Bend’s south side. The students, directed by Kim Rollings, assistant professor of architecture at Notre Dame, will present plans for a 30,000-square-foot facility to provide safe and affordable housing for chronically homeless people. The students’ work on the project included extensive research on how architecture affects physical, mental and social health. 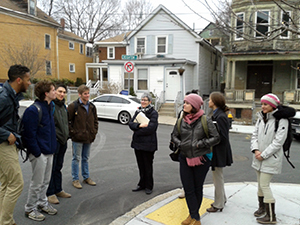 Earlier this year, they visited Boston to study groundbreaking examples of PSH designed by The Narrow Gate Architecture Ltd., a firm started by three Notre Dame School of Architecture graduates to serve marginalized people in urban communities, and to share a meal with and interview residents of the PSH facilities there. Among those to whom the students will be making their presentations will be South Bend Heritage Foundation executive director Marco Mariani; the PSH architect Bill Lamie of Alliance Architects in South Bend; Mary Gibson, regional/compliance manager of The Bradley Company in South Bend; and Notre Dame alumna Kitty Ryan of The Narrow Gate Architecture Ltd. Originally published by Michael O. Garvey at news.nd.edu on April 18, 2016.